The quintessential history of IITs in India can be traced back to India’s revolutionary pre-independence era when, for the first time, Sir Ardeshir proposed the concept of IITs right after the second world-war. Owing to Sir Adheshir’s vision of India’s massive future dependence on technology, first major IIT was founded in Kharagpur in 1951 and Sir J.C. Ghosh (the then Director of Indian Institute of Science) who, along with Prime Minister Jawaharlal Nehru, played a vital role in introducing IITs in India became its first director. And ever since, IITs have become the foundation of India’s endless growth and have also contributed immensely to its modern image. However with the introduction of BITS Pilani (Birla Institute of Technology and Science) in 1964, the limelight that only IITs had hogged so far was divided abruptly, owing to BITS Pilani’s overwhelming reception amongst a large group of students. Although both, IITs and BITS-Pilani, have walked parallel to establish India’s unparalleled technological image in the world, the comparisons were inevitably drawn with or without logics by a large Indian group. These on and off comparisons have now become a national debate, which, many groups believe, has no concrete conclusion in the near future. One’s superiority over another is illusive and hard to predict by mere unresponsive facts. Hence to help you find the better of the two, we’ve looked at the comparison between IITs and BITS Pilani the other way. Unlike existing comparisons, which are mostly biased or unreal, we have tried to view these comparisons from the perspectives of students from IITs and BITS-Pilani. Let’s take you through this detailed study carried out by us. To really understand how important or effective a strong entrepreneurial culture can be for any campus, we should rather take an example of Massachusetts Institute of Technology, MIT. The total revenue of the companies founded by MIT graduates is on the verge of surpassing the mark of whopping $2 trillion, which is far more than India’s current GDP. That explains how the number of graduates from IITs and BITS-Pilani, those who have founded companies, can be taken as an ideal yardstick to figure out the better between the two. According to official reports, BITS Pilani has been experiencing a constant growth in the number of companies founded by its students. GharPay, Zivame & Exotel, and redBus have their founders tracing their roots back at BITS Pilani. On the other hand, Scripbox, Online Prasad, Grey Orange Robotics, Forus Health, BigBasket, and Attune have their co-founders from BITS Pilani. Not only strong entrepreneurial, but also BITS’ modern take on education, all around development, and innovate exposure makes BITS Pilani stand out from the rest. Now to talk about IITs, the institution has also produced founders of many prestigious start-ups in India and abroad. Let’s go through the table given below to know the founders of such start-ups from IITs. Total number of students who graduated last year from IITs was 6491 while those who passed out from BITs Pilani were approximately 2000 students. Understandably, it’s a huge difference between the two. This means that the campus with the highest number of students passing out every year is producing more number of successful engineers than the other. More number of engineers means more number of successful entrepreneurs and a great economic boost for the country. 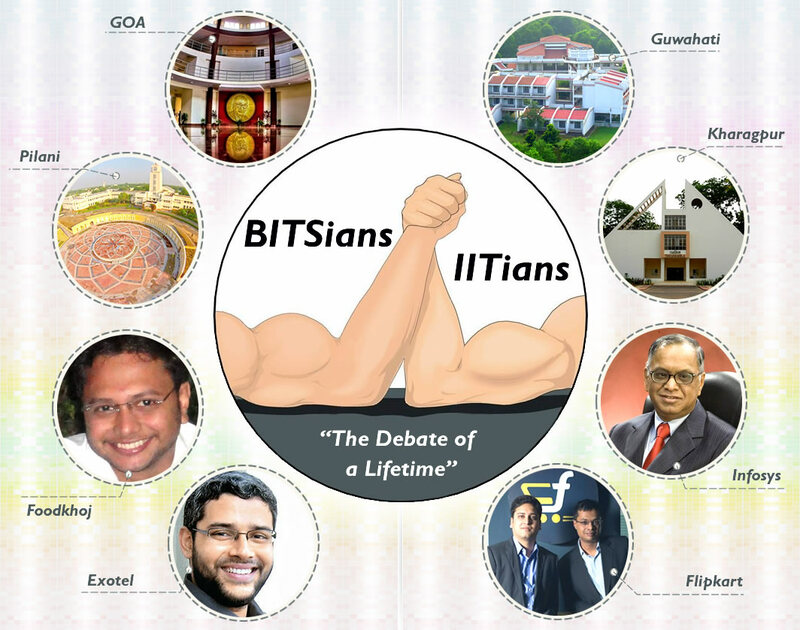 Although both IITs and BITS-Pilani have had a parallel walk to India’s growth, there is a huge difference between IITians and BITSians holding prestigious positions in the corporate world. Soumitra Dutta from IIT-Delhi is the Dean of Cornell University’s Management School. Dipchand “Deep” Nishar is the most paid manager currently working at LinkedIn. On the other hand, there’s Vinod Khosla from IIT-Delhi again, one of the most influential personalities in Silicon Valley, the co-founder of Sun Microsystems. We can’t forget Nikesh Arora, a graduate from IIT-Varanasi, who is the Senior Vice President and Chief Business Officer of Google. He is one of the most paid employees working with Google. Baba Kalyani (the chairman of Bharat Forge), Sanjay Mehrotra (President and co-founder of SanDisk), Prithviraj Chavan (Chief Minister of Maharashtra), Gullu L. Chandani (Founder and CEO of Onida Electronics), Sunil Duggal (CEO of Dabur), and Rakesh Kapoor (CEO of Reckitt Benckiser) etc. are some of the most notable Alumni from BITS Pilani. Apparently, number of notable positions held by IITians and BITSians, again, entirely depends on the number of students graduating every year. Obviously, more number of students passing out every year from any institute will have more chances of securing more notable positions in the corporate world. A lot of factors are taken into account by companies when determining average pay packages for both IITians and BITSians. So to talk about a particular average pay package here, we will actually end up doing a lengthy, complicated discussion without any concrete conclusion. We must rather tread on to a safe and, of course, a less complicated path. Let’s review average pay packages based on last 5 years’ packages offered to students of B.Tech at top IITs and BITS Pilani campuses. The average pay package offered to any IITian (B.Tech) is anywhere between Rs 43750 and 48,000 monthly. The average pay package offered to any BITSian (B.Tech) is anywhere between Rs 39500 and 43,000 monthly. However, you must not forget that there is a lot of variance among these packages due to various factors. Salaries go up and down as per the ability of candidates and their academic performances. Average pay packages vary for candidates receiving job offers from abroad. As per official records, finance companies offer best packages to their employees. Goldman Sachs, Tower Research Capital, and World Quant etc have offered 20 lpa to IITians. The world’s attention turns to IITs and BITS-Pilani suddenly every year with the news of fat pay packages offered to their students. But if we talk about who beats another when it comes to bagging the highest pay packages, then there’s a lot of disparity to witness here. There are 12 IITians from IIT-Kanpur who have very recently bagged a fat pay package of Rs. 1 crore each while there are these two incredible BITSians who have bagged the highest pay packages ever in India till date with Rs. 1.44 crore. But again, as in case of average pay packages offered to IITians and BITSians, highest pay packages too depend entirely on candidates’ abilities, academic performances, and other important factors. Despite being among the proudest technology institutes of India, educational and college environment of the two differ drastically. And if this is the only factor one has to consider, then, obviously, BITS Pilani will score more points than IITs. In fact, the popularity of BITS-Pilani among its engineering aspirants is highly driven by its educational and college environment. The ambience of BITS Pilani’s campus is both inspiring and vibrating with perfectly planned and aligned layout for the whole campus, libraries, and hostels. IITs cannot beat the BITS Pilani’s unique concept of taking tutorials from the teacher of students’ choice. BITS’ cultural events such as Grubs are mind blowing. They don’t only help you delve into your Indian roots, but also help you find the real you. According to a survey, many students believe that BITS Pilani adapts faster to changes in educational sector than IITs. For example, Engineer Graphics in BITS is still called Engineer Drawing in IITs. BITS uses AutoCad for Engineering Graphics while IITs still go the traditional way. All right! As IITs are run by the government of India, their fee structures are inevitably lower than that of BITS Pilani’s campuses. Let’s take a look at the fee structure of top IITs across India in general category. The total fees payable at the time of admission at IIT-Bombay is Rs 67,876 while the total fees payable at the time of admission at IIT-Delhi is Rs 56,635. The total fees payable at the time of admission by students at IIT-Kanpur is Rs 66,517 while it’s Rs 57,876 at IIT-Kharagpur. IIT-Roorkee charges Rs 63,820 while IIT-Madras charges Rs 54,927. BITS Pilani is very expensive as even its integrated first degrees program cost over lakhs. To meet all contemporary educational demands and needs of students, both IITs and BITS Pilani’s campuses are equipped with quality infrastructures complementing their reputations. However, as BITS Pilani seems to have made it a point to adapt to changes in technology faster than IITs, BITS is equipped with better infrastructures than IITs. Although about 4-5% IITians prepare for CAT just after graduation, this percentage increases from 40% to 60 % once candidates earn quality work experience. And about 60 % students receive degrees in MBA. Most IITians also prepare for Civil services. On the other hand, 50% to 70% students receive degrees in MBA while 10-20% students opt for research in India or abroad. However, students from BITS Pilani opt less for Civil Services as compared to IITians. BITS Pilani has carved a special niche for itself with its international infrastructure and excellent faculty. And on the other hand, IITs are facing an all-time shortage of faculty as standing committee on Human Resource Development reports. As a matter of fact, the condition of new IITs is even worse. IIT-Hyderabad has a requirement of 85 faculty members while, as standing committee reports, it currently has 74 faculty members. IIT-Bhubaneswar has total 50 faculty members against its requirement of 62 members. Owing to this serious concern, most IITs have already started aggressive communication campaigns across the country to reach out to post docs and graduate students of top universities worldwide. IITs are also organizing meetings in various universities around the world. With the aforementioned discussion, you can now draw your own standard comparisons between IITs and BITS to choose the one institution you find the best. To simply rely on studies before taking admission is an outdated practice; modern generation now needs an unbiased platform from where it can view facts and take decision accordingly. The discussion above is one such endeavor by us to help you gain better understanding of existing environment in IITs and BITS-Pilani. You are most welcome to share your views, opinions, and even disagreement with the article. To help us bring you breaking news and Informative Articles please subscribe to our blog! « Is BITSAT more competitive than IIT-JEE?